The TIE interceptor, is an improved version of the TIE fighter that is identifiable by its bent-wing and arrow-shaped side wing panels, as distinct from the hexagonal ones on its predecessor craft. The interceptor is also blue while the older TIE fighter is grey. Otherwise both fighters play the same roles of "space superiority" and share many of the same attributes, including a similar (if not completely identical) spherical command pod. TIE interceptors are seen in the massive fleet battle in Return of the Jedi. 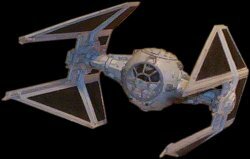 Rebel Alliance and New Republic pilots refer to TIE interceptors as "squints", due to their narrow profiles (as compared to TIE fighters). The design is a development of the TIE Advanced Fighter. Like its predecessor, the TIE fighter, the TIE interceptor carries no shielding but has superb acceleration and maneuverability. Improved avionics have been implemented and the radiator-panels have a cut-out notch to improve lateral visibility. With one cannon mounted on each of the four wingtips for a total of four cannons the TIE Interceptor has considerably more firepower than its predecessor.